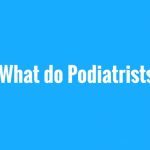 MELBOURNE PODIATRISTS: WHAT CAN THEY DO FOR YOU? How much does a foot suffer? Well, studies have estimated that a person with an ‘inactive’ lifestyle will take between 3,000 and 5,000 steps per day, while as many as 7,500 steps are taken by ‘highly active’ people. For sports people, like joggers, can take as many as 12,500 steps on average per day. But whatever your lifestyle is, it’s clear that the foot is one of the most used parts of the body. As a result, it is prone to injury, disease and the development of biomechanical flaws. This is where general or sports podiatrist can make the difference. It would be easy to describe a podiatrist as a ‘foot doctor’. In fact, what your Melbourne podiatrist can do is more than simply treat corns and bunions. Rare skin and nail conditions are examined, while motor, circulatory and sensory tests are also carried out. Diagnosis is extremely detailed mainly because of the complexity of many of the foot conditions that exist. Basically, a podiatrist tends to the health of the entire lower limb, paying attention to how associated diseases (like diabetes) and lifestyle activities (like sport and fitness regimens) affects it. Of course, these conditions can range from the treatment of calluses to removing ingrown toe-nails and from arthritis to foot deformities. But just as important as an accurate diagnosis is the monitoring of cases, much as doctors will monitor an illness. This translates to a very high level of medical attention, which in turn means patients are more likely to recover. 1. The Aged – It’s commonly known that the elderly (over 65 years old) suffer more severely from limb pain, especially the feet, ankle and knees. In fact, according to a submission to the Productivity Commission Health Workforce Study on Podiatry in 2005, some 85% of Australian aged over 65 years required podiatric services. Meanwhile, between 2004 and 2008, some 75% of 1.3 million podiatry consultations in Australia under the Medicare Enhanced Primary Care program were patients over 65 years of age. 2. Diabetics – Diabetes is now a major health problem, with the Australian Diabetes Council (ADC) claiming 3.6 million Australians have diabetes or pre-diabetes. One of the most common complications resulting from the disease is lower limb problems, with poor circulation causing foot ulcerations and sometimes leading to amputation. In 2005, it was estimated that 40% of diabetics develop general foot problems. Podiatric treatment has proven to greatly reduce rates of foot ulceration and amputation. The ADC recommends good foot care as an important part of defeating the disease. 3. Occupations – Certain professions are more susceptible to foot injuries, like nurses, hairdressers and factory workers. In Melbourne, podiatrists treat hundreds of such people every day, finding practical solutions that allow them to continue working but in much greater comfort. 4. Children – Children’s feet are not fully developed yet, so it is an area that requires mostly preventative treatment. According to the Australian Podiatry Association (APA), common conditions may include toeing-out, bowlegs and knock knees. Podiatry can help prevent foot deformity later on, so appropriate footwear and special exercises may be prescribed. 5. Sports People – Arguably, this is the most obvious area in which podiatrists medical expertise are required. From ordinary joggers to competitive athletes, the impact that running can have on feet and legs can be very negative. Of course, sport is a hugely important area in podiatry. Your qualified Melbourne podiatrist is highly skilled in helping sportspeople of all disciplines overcome a wide variety of injuries. Critical to good treatment is an understanding of the biomechanics of athletic movement as well as knowledge of general foot conditions. Typical treatments involve specific exercises and training regimens. The adoption of special footwear and sometimes the addition of orthotic devices to fit into the sports shoe are also parts of the treatment process. Stress Fractures – This is usually occurring in the metatarsal bones and the navicular of the foot, as well as the shin. Stress fractures develop because of biomechanical imbalances. Treatment involves 4-6 weeks of rest and some special exercise techniques. Retro-Patella Chondralgia (runner’s knee) – This is when a malalignment in the lower limb can cause swelling behind the kneecap. There can be several different contributing factors to the condition, so careful examination is required before your Melbourne podiatrist decides on a detailed treatment strategy. But generally, it involves special exercise programs and the use of specific orthotics. Knee Osteoarthritis – This is the cartilage damage in the knee caused by gradual wear and tear. This can cause considerable mobility and leg alignment issues. Like most forms of osteoarthritis, the root cause can be hereditary. Treatment recommended by a sports podiatrist often involves strength-building exercises for the foot, leg and pelvis, often with the use of special orthotics. Surgery is usually the last option..
Achilles Tendonitis – The tendon connecting the heel and the calf has a poor blood supply. So, the high demands placed on it by athletes, leaves it prone to inflammation. An ultrasound is commonly required for early detection. Rest, ice and a special strengthening program are usually required. Sports podiatrists will identify biomechanical overload factors and prescribe appropriate orthotics and footwear. Based in the heart of Melbourne, podiatrists here at mhealth have been helping clients of all ages, professional and any backgrounds not only overcome injury and pain in the feet and lower limbs, but also prevent the development of serious conditions in the future. Our team of highly qualified general and sports podiatrists will carry out detailed examinations of your condition, before offering diagnosis and a practical treatment as well as rehabilitation strategy. We use state-of-the-art technology and the latest equipment to accurately assess, diagnose and treat a wide range of conditions. For more information on what mhealth Melbourne podiatrists can do for you, check out the mhealth website and contact us directly either via our online form or call us at (03) 8585 2222. This entry was posted in Tips Physiotherapy & Osteopathy Melbourne on February 16, 2015 by MHEALTH.